I will be having a solo show Love and The Unwritten Lyrics - The Art of Heather Shirin at 2 Rules Fine Art in Marietta GA from April 4th- May 30th 2014. Opening reception with the artist, Friday, April 4th 2014 from 6-8pm. "Heather Shirin’s paintings are quiet and reflective portraits of women with other women. Shirin’s mixed media portraits, mostly large-scale, are painted on deep birch wood panels. Shirin purposely allows the natural beauty of the wood grain to shine through in the skin tones of her female figures. Various fine art papers are used to depict clothing, and elements such as gold leaf and metallic paint give the pieces a highly reflective appearance. Intricate designs add texture and depth to the works, creating modern portraits in a style that is reminiscent of Art Nouveau period pieces. Shirin received a B.F.A. in oil painting from the University of Massachusetts, Amherst, and she studied design at the Museum School of Fine Arts, Boston. Her exhibition history includes NY, MA, PA, NC and now GA. She is a juried member of the National Association of Women Artists. 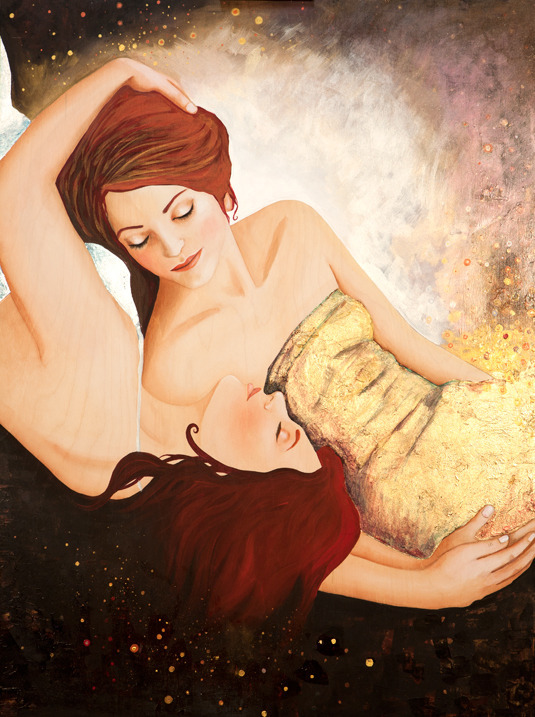 She currently resides in Asheville, NC, where she teaches Art Nouveau Portraiture and Mixed Media Classes. Heather’s upcoming solo exhibition, The Unwritten Lyrics, will show April 4 to May 30 at 2 Rules Fine Art in Marietta, GA. Two receptions will be held from 5 to 9 p.m. on April 4 and May 2 at the gallery during First Friday Art Walks in Marietta, which is part of the Atlanta GA metro area."